100% Open Source and No core file changes! CS-Cart 4.x Ultimate & Multi-Vendor Editions. For CS-Cart 2.x - 3.x, please contact us for more details. 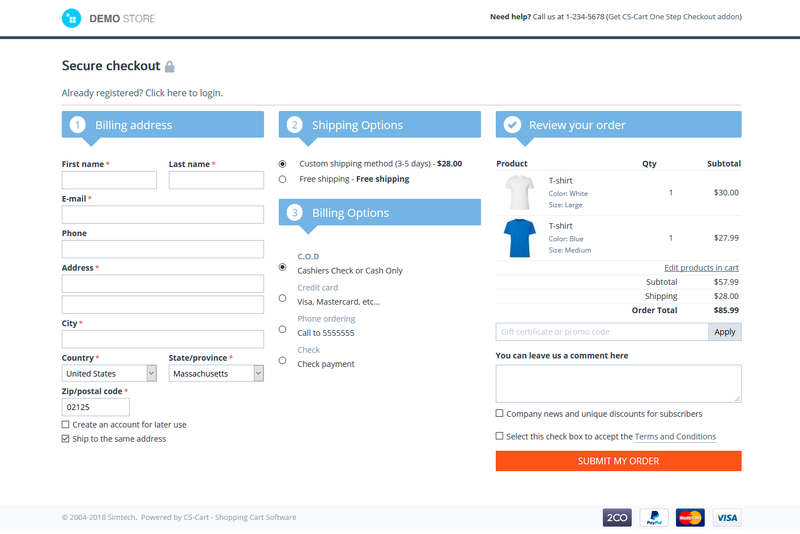 Have your customers complained that the CS-Cart default checkout steps are too many and very complex? 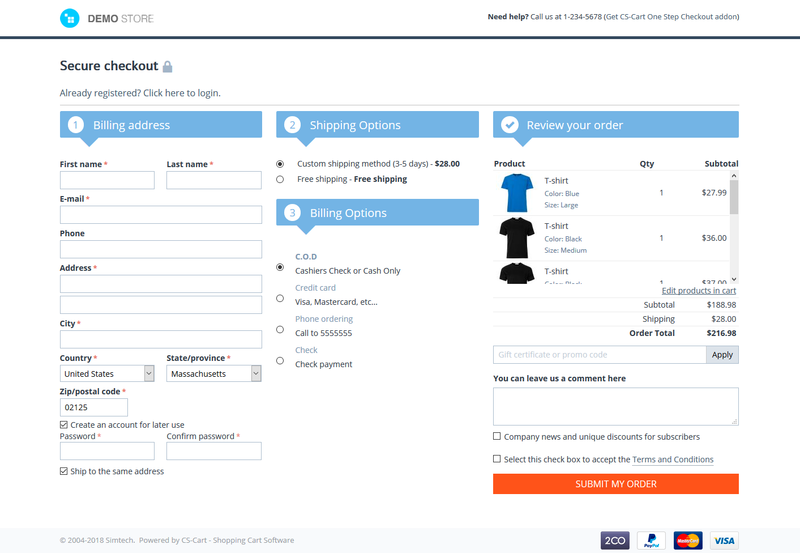 CS-Cart Rocks One Step Checkout Addon has solved this problem and allows your customers to enjoy the ultimate checkout experience by combining all the steps into one step only. Your customers will see all the information directly and can fill in or edit any section without waiting or going back and forth. There is also an option which will only show your store logo and checkout help block on the header. 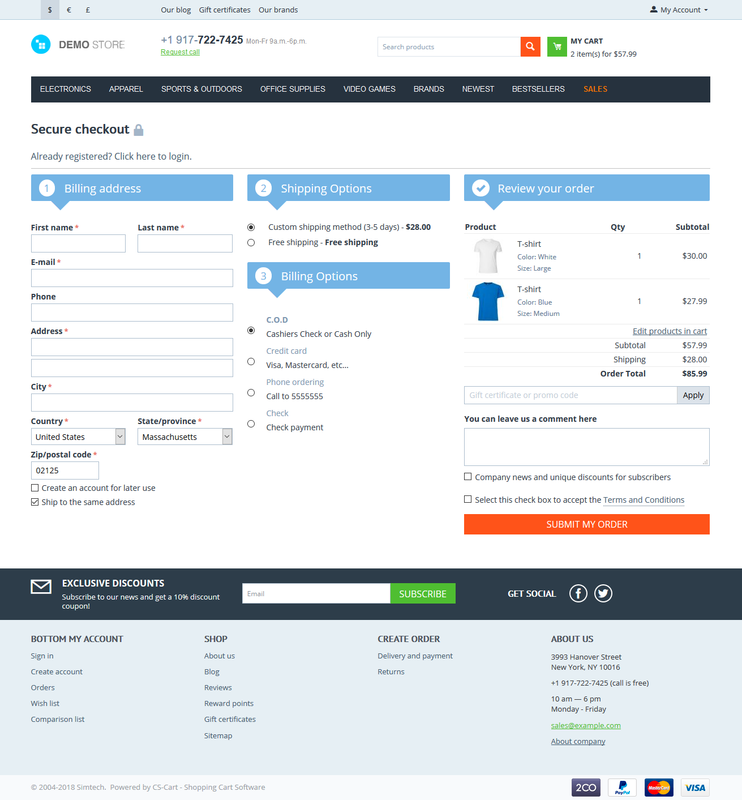 This professional look will make your customers focus on completing the checkout as fast as possible. Click here to view Customer Reviews for One step checkout addon on CS-Cart Marketplace. Live site showcase: here is a large live site which we've got permission to share here from our client: ambient lounge (it's a live site so please no test orders). They are very happy about how easily the addon can be customized to fit their needs and it's been performing very well for them with increased sales. If you choose CS-Cart as your shopping cart, our One step checkout addon will be your best choice. Featured: Free addon installation for both default and custom themes. There will be no down time for your site thanks to the addon's Test mode. Compatible with ALL third party themes like VIVAshop, ENERGOT, UniTheme, YOUPI, Buyshop and others.